Ottawa Structural Residential Services Ltd. is reliable foundation contractor. Contact us today if you would like to find out how much it would cost to have these services performed for your property. The clientele of Ottawa Structural Residential Services Ltd. includes home owners, property management firms, major builders and developers, government and institutional agencies. Let us design a new look to the front of your house or simply replace the existing asphalt laneway, please remember if you’re planning on creating a new laneway, widening the existing laneway or closing off your laneway you have to apply for a “Private Approach Permit” with the City of Ottawa in accordance to By-law 2003-447, it is the clients responsibility to inquire with the city if changes can be made to the existing configuration of your laneway. Our services include removal of existing asphalt and granular base material, new compacted granular and placement of new asphalt utilizing a spreader and rolled compaction. "'Waterproofing' is a broad term used to describe a range of services performed to fix a wet basement." One of the most critical factors in basement waterproofing is to correctly identify the source of the leak. We accomplish this task by performing a site visit and consulting with the homeowner to determine where and when the problem occurs. Foundation cracks and/or inoperative weeping tile systems are the most common causes of basement leakage. Water which seeps into the basement at the base of the walls, at floor level, or through cracks in the floor, usually indicates that the weeping tile system is not working. Many homes in the Ottawa-Carleton area, constructed in the 1950's-1960's, have terracotta clay weeping tile, which over a period of years, can become plugged with clay or sand or can crumble and collapse, preventing the water from being carried away from the house. Homes built prior to 1950 almost never have any weeping tile system at all. Clay soil conditions are a hazard of the Ottawa-Carleton Region. Clay allows water saturation of soil, rather than drainage which is required in order for water to flow to a weeping tile system. Saturated clay will freeze and often, with the thaw in the spring, will cause foundation cracks and poor drainage in window wells, resulting in back-ups and flooded basements. Foundation construction materials have changed over the years. Materials used in the Ottawa-Carleton area include rubble stone, boulder stone, cinder block, concrete block and the current standard - poured concrete. Poured concrete walls, especially those in newer homes, are the most resistant to leakage; however, they too, often develop cracks that allow water to enter. Concrete blocks and stones are quite porous, which can result in water seepage directly through foundation walls when the ground is saturated or the water table rises. Water can also seep through the porous mortar joints between bricks, stones, or concrete blocks. In addition, the hollow cores of concrete blocks may eventually hold water, thus, when the water level within the blocks is higher than the basement floor, water seepage occurs. Other common culprits include poorly positioned downspouts and missing, leaky or plugged gutters. Downspouts should direct water runoff from the roof to a discharge point several feet away from the house. A downspout that is improperly positioned to drain against the side of the house allows water to build up along the foundation wall, until the backed-up "reservoir" finds a weak spot to enter the basement. Gutters should be cleared of leaves and debris at least once a year. Basement leakage from either of these causes is usually restricted to one spot and disappears when the external problem is fixed. Improper surface drainage is another common cause of basement leakage. In many cases, this can be alleviated simply by re-grading the yard to slope slightly away for the home's foundation. In many situations water infiltration may result because of a simple crack and can be remedied with polyurethane injection . This creates a permanent repair under wet or dry conditions and is environmentally friendly. When excavation of your foundation is required, Platon Foundation Protector is installed on the exterior of the foundation wall. Both methods ensure a dry basement. Looking to replace your old deteriorated deck and fence or simply looking for a new installation? Let us review your project with you and install something in Red Western Cedar to give your backyard or front entrance a face lift. Sometimes the structural integrity of the foundation is undermined, and the only option available is to remove and replace a portion or all of the foundation walls. This work can be completed while you live in your home. Our staff are thoroughly trained and experienced in the complexities of this undertaking and every effort will be made to complete the work with minimal disruption. This option is also a consideration for those with older homes with low ceilings which render the space unusable due to a lack of head room. A deeper, dry basement would allow you to add living space without having to build an addition above ground; particularly desirable to those who do not wish to sacrifice outdoor yard space on small urban properties. Sinking foundations, cracked and buckled walls, and uneven floors are problems commonly faced annually by some quarter-million homeowners. Homes and other structures situated on unstable soils settle when their foundations are subjected to extreme moisture conditions or lack proper drainage. A shifting foundation may result in structural damage to your home and a loss of your investment. Wanting to replace your garage floor or maybe you live in an older house and would like a new basement floor? We provide both services, it is recommended to replace all existing concrete with new concrete vs. resurfacing or “capping” We can provide a steel trowel or broom finish on the floors complete with control joints. Concrete specifications can vary dramatically depending on the application; let us assist you with your project to ensure you have the correct mix design for your new floor. 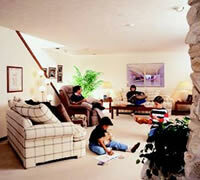 Basements are imperfect structures built in soils that vary. Water in the soils leaking into basement is a problem that has troubled homeowners for over 100 years. This water will enter the basement through walls, floors and joints between them. Over the years, contractors and engineers have developed a wide variety of methods to keep basements dry. Some of these methods are more effective than others. 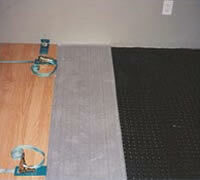 Among the best of these methods is to install a sub-floor drainage system along the perimeter of the floor. Here are a few challenges to this method. One is to keep the drain from being clogged by mud over the years. Many homeowners go years without a water problem and then develop one because of existing sub-floor and sub-surface drains clogging with mud. Another is to set up the system to accept water from the walls without leaving a large unsightly gap at the edge of the floor which can collect dirt and debris from the floor, also clogging the drain. Invest some money in landscaping and increase your property value. Interlocking stone will be the best return on your exterior investment. We can create and install a new walkway, laneway, patio or retaining walls for that project you have always been dreaming about. We provide services to reparg the perimeter of your foundation or maybe it is only required along the length of one wall, corners of your foundation have broken off above ground level? Let us fix these problems for you. Contact our office and we can walk around the perimeter of your house to make the required recommendations to maintain or improve the exterior look of your foundation. Let us supply and install a new patio with a wide variety of interlocking pavers that are available in the marketplace. Contact our office and we can review products and ideas from Permacon or Techo-Bloc. Platon, used as a flooring protector, will insure your floor is warm, comfortable, odour-free, healthy and dry. Laying floor covering on concrete? A beautiful floor may hide a rotten reality. Even though a floor may look good on the surface, the reality underneath may be entirely different. Concrete floors will always contain moisture. Floor coverings laid on concrete without an adequate dampproof barrier will be affected and damaged. The results are bad smells, mold, mildew and an unhealthy internal environment. A moisture barrier that does not provide air flow under it will trap moisture and cause problems. By using Platon over concrete, an impermeable vapour barrier and air gap is created. This allows the concrete to breathe while keeping the floor dry. The finished floor is lifted from the cold damp concrete and becomes room temperature, which minimizes surface condensation and musty smells. Platon gives you new freedom of choice in floor covering materials. It is a suitable underlay for laminate floors OR, when covered with plywood or OSB board, for carpet, vinyl and engineered hardwood. Over fresh concrete, you can install flooring as soon as you can walk on the slab so it makes sense to install Platon and plywood or OSB board over the concrete to eliminate scheduling delays and moisture damage to newly installed flooring. Non load bearing walls can be built right on the sub-floor! Platon can also be installed on floors with radiant heat with very little effect on heat transfer. If your basement is unfinished and the walls are damp, Platon may be run horizontally along the walls after the sub-floor has been installed. Seal the top (smooth) edge of the Platon to the concrete portion of the wall with caulking to keep moisture out of the sill plate area. Frame the walls right on top of the sub-floor, insulate against the Platon, and be sure to use a vapour barrier over the insulation before dry-walling. Cracks are usually caused by settling or movement after a house is constructed and commonly appears at the corners of windows or any other place where the foundation has been "notched", and often the slightest amount of rainfall can cause the cracks to start leaking. If you were to investigate the conventional method of repair - excavating, veeing-out and packing with a quick setting cement - you'd find that it is quite expensive and a great deal of work. There is a better way! For years now, engineers, architects and waterproofing professionals have known about polyurethane crack injection and its effectiveness in repairing concrete leaks. It has been proven worldwide in various applications including the repair of underground tunnels, water reservoir tanks, and parking garages. The average homeowner has been left in the dark, until recent years when the growth of polyurethane crack injection into the domestic market revolutionized the industry. A highly technical, yet relatively inexpensive repair procedure, polyurethane crack injection is performed from the inside of your home, eliminating the destruction of landscaping. There are no health concerns with this material as it is non-toxic and odourless. The injection process is performed through the use of a high-pressure pump machine. This machine ensures 100 percent penetration of the polyurethane, filling the crack completely, from inside to outside, preventing water leakage. We do not use caulking guns or lever guns. Ottawa Structural Residential Services Ltd. utilizes polyurethane exclusively for the interior repair of foundation cracks. 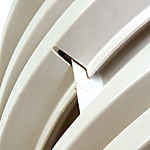 Polyurethane is a flexible, water reactive, non-shrink material. These are crucial factors when you consider that further movement or vibration could re-crack other types of repair materials such as epoxy. Have a failed retaining wall on your property that requires replacement? Need to install a new retaining wall around a flower bed? Want to improve the look of your existing retaining wall with something a little more modern? Call our office regarding your needs and let us take care of that project for you. With today's rising housing costs, more and more homeowners are discovering that basement areas are the best and most economical way to increase the amount of living space in a home. Whether it's a remodelling project or new home plans, ScapeWEL® Window Wells will add light and ventilation to your lower level living areas, making them as warm and comfortable as any other room in the home. With ScapeWEL®, you'll also add safe emergency egress to finished rooms. 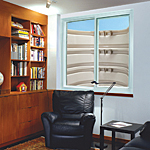 The terraced step design of the window well meets building code requirements for emergency egress. These same on site steps can be landscaped with your favourite flowers or plants for further visual enhancement. The StakWEL® window well system consists of individual modules that simply slide together for fast and easy installation. 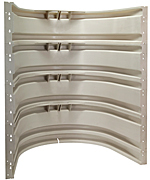 This flexible system allows you to stack modules to accommodate virtually any foundation depth. The Hydromatic® Sump Pump includes the finest pump available, a high end 1/3 hp cast iron pump with a wide-angle float switch. It pumps 38 gallons per minute, smoothly and quietly. It resists clogging and can pump up to 1/2" solids. It will perform reliably for many years. Although the pump is very quiet, the discharge line is equipped with 1 ½ rubber fittings for additional sound and vibration reduction. 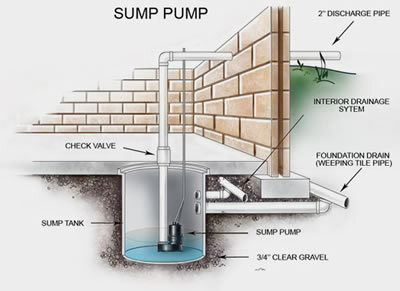 Relying on a sump pump without an alarm makes no sense. If the circuit breaker trips, the pump cord is unplugged or the pump fails for any other reason, you experience costly floor damage without warning. The system sounds off (like a smoke detector) if the water rises above the point where the pump should turn on. The gives you warning to address the problem before any damage occurs. The 18" x 24" smooth wall polyethylene liner is rugged, heavy duty, and has holes to allow water to flow in directly from below the floor. It features a "pump ring" on the floor of the liner which prevents the switch from hanging up on the sidewalls by keeping the pump in the center. 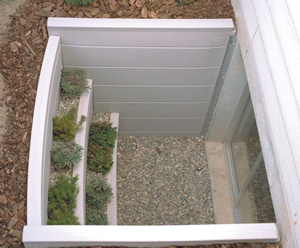 The lid keeps moisture from evaporating into your basement environment. It also keeps out bugs, odors, radon gas and quiets the pump. It keeps objects (tools, laundry, stored items) from falling into the sump hole. In fact, the lid is so strong, you can stand on it, and stack items on top so you don't sacrifice any storage space for the sump. As a safety feature, it keeps children out, which is very important. It also features a 2-piece design so the pump can be serviced without disconnecting the discharge line. Installation of a front walkway is a great way to open up the front of your house, tired of that uneven ground going into your backyard, let us help you design and install a new walkway to meet your requirements. Water infiltration in your basement may be the result of a failed, blocked, collapsed or no weeping tile around the perimeter of you basement. Our services include complete or partial replacement, C.C.T.V camera inspections, power flushing and test pit excavations to determine the condition of your weeping tile. We can evaluate each project and provide a solution to resolve your problems. Poor drainage in your window wells can result in a flood occurring in your basement. It is essential to have all window wells draining properly to avoid the potential of this event. 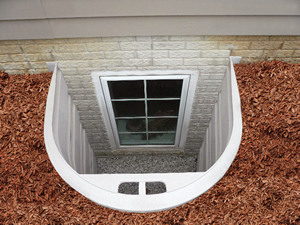 We provide services to excavate your window wells and promote positive drainage to the weeping tile to avoid floods. Allow us to review and discuss options that maybe available for your project and ensure that your window wells will drain year round.